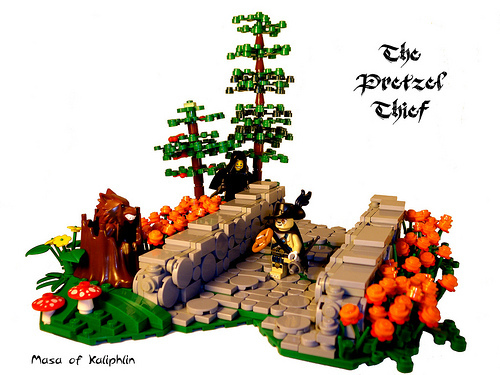 A LEGO model built predominantly from a single colour generally needs to be something special to grab the eye. 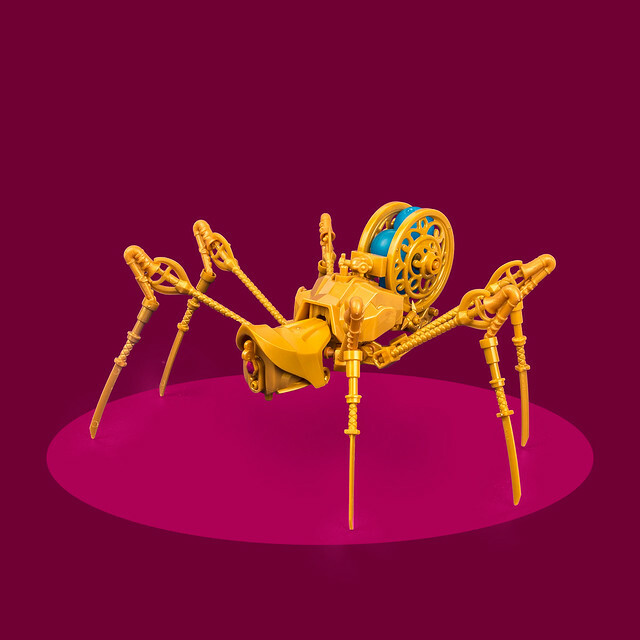 This gleaming clockpunk-style spider beastie from Markus Rollbühler manages to do exactly that, using a variety of textured pearl gold parts to provide lots of delicious mechanical detailing in amongst the bling. The eye in the mechanoid’s “face” is a brilliant parts choice, and I like the egg-sac feel of the teal balls held between the wheels of the abdomen. Katana for the lower limbs make this thing look like it’s tip-toeing around, but it’s the use of saxophones for knees which is the masterstroke here, adding touches of tiny texture to a nicely angled joint, and proving once again there’s no such thing as a single-use LEGO part! All true spiders have eight legs, my friends. Unless, of course, they lose a couple to predators, which is fairly common, but I digress. 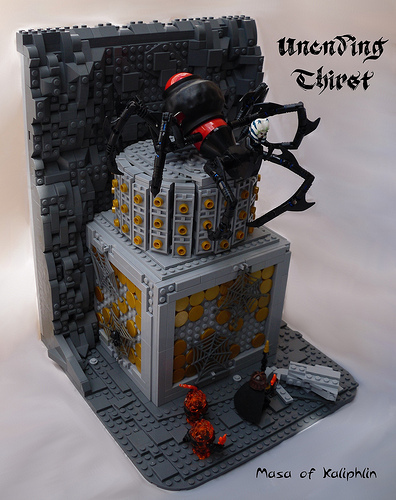 Fortunately for those in the creative LEGO world, arachnids can have as many legs as they darn well please! And so a contest has been born. 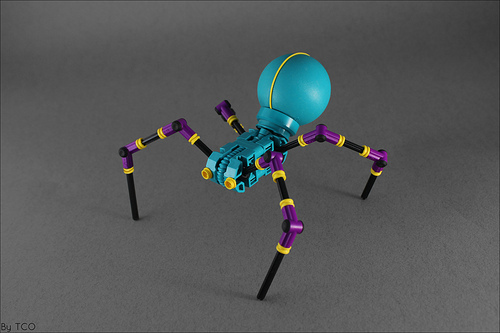 BBC contest №76 is dedicated to building spiders without eight legs, and this is an entry by Leonid An. This cyber-esque build caught our eye with its neat parts usage and great color scheme. The turquoise and purple pieces were popular in Technic and Bionicle sets from the late 90’s and early 2000’s. Leonid is a great builder who we’ve featured before. Check out his Horus and Set, as well as his eerie-looking “Sleuth” from a couple months ago. Sometimes, a relatively simple build can have a big impact. This scene built by Lennart C and inspired by nature is a great example. This black widow spider looking to make a meal of a nearby fly is both beautiful and terrifyingly realistic, which is no easy accomplishment considering how few parts are involved. One of my favorite details is the simple choice of using that longer arm piece for the two back legs, giving the body a more pronounced slope. And speaking of the fly, only six parts are used, but the effect is perfect. Just one warning. I wouldn’t stomp on this spider if I were you, it would probably hurt you more than the spider. Please enjoy Masa’s Pretzel Thief at no extra charge, I think you will enjoy the bridge.